Sorry it's been so long since I last wrote. All 3 of our computers crashed at the same time so we've been computerless for a while. But my family had a really nice Easter. Katy is doing alot better. She's on a strictish diet and that seems to be helping her alot. Praise the Lord! I just had my wisdom teeth out last week. Other than swelling and bruising of my jaw, I've had a relatively good recovery. A really awesome thing happened today that I'd like to share: I have been praying alot about going to a community college for nursing or just getting my LPN degree through a Boces program. I really don't want to go through a year of liberal arts then go to medical school. Anyway, I found out today that the next LPN program doesn't start until December 2010. I really don't believe the Lord wants me to waste 1 1/2 years not going to school so I might as well just go to the community college and get my RN degree. I've also been praying alot about going to To Every Tribe Ministries training program in September of 2010. It's an 8 month hands on training program. There are opportunities to go to Mexico and Papua New Guinea. I'm extremely grateful that the Lord answered my prayer! 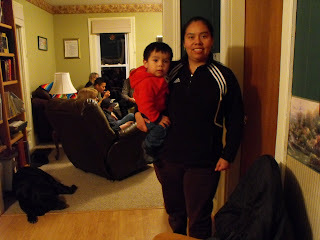 On Friday, we were blessed to have a houseful of people. 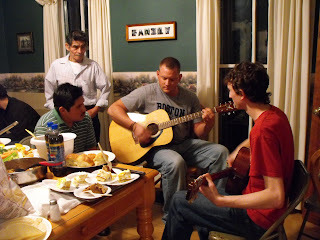 Our Mexican amigos and some other friends came over for dinner because our interpreter for the Bible study is in Mexico. Here are some pictures: The first picture is Jairo, Bethany, and Rudy; all very fun people to hang out with :) The next picture is Tirbercio, Cesar, Roy, and Erik. Cesar is learning guitar and Roy taught him a couple chords. 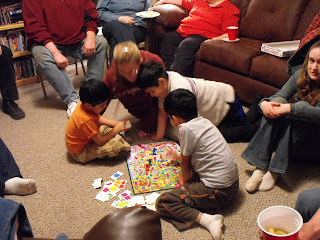 The next picture is Katy playing Candy Land with young Cesar, Antonio, and Dominique. They are the cutest little boys ever!!!! I love them so much. They've been coming to Sunday School at our church for a few months now and are such a blessing. 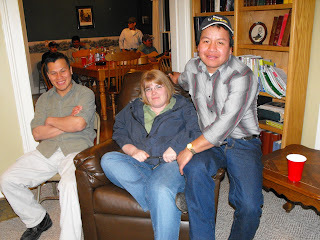 The last picture is their mom and brother, Elisabeth and Jason. All these people are so wonderful to be around. God is blessing our ministry to them in a marvelous way! Thanks for praying for me. The spanish dinner was sooo much fun :) So glad that the Lord is leading you in your life :) Love ya! Cool! Didn't know you were interested in the medical field. Not sure what I want to do in life,but I've got three more years to decide so I'm not really worried about it. Glad you've got it all(or mostly) figured out!